This is the latest in a series of books about Arthur Bryant and John May, an eccentric couple of "senior" detectives (post retirement but not admitting it) who are making an impact in an unusual Home Office department, the Peculiar Crimes Unit (PCU). Having not read the rest of this series I was prepared to be a little at sea about the characters, but, from the start, Christopher Fowler's engaging writing enabled me to understand a little about the personalities with a light touch that would not turn off dedicated readers of the books. Leaving the wake of Oswald Finch, old friend and pathologist to the PCU, Arthur Bryant sees a middle-aged lady coming out of a pub in a backstreet, apparently drunk. She is next seen on a slab in the mortuary and the pub has mysteriously disappeared. Arthur starts to disbelieve his own eyes, as the pub he remembers her coming out of was demolished in 1925. In addition, he has lost Oswald's ashes. Is he finally succumbing to old age and an unhinged mind? However, he has a hunch and, looking through recent sudden deaths, it appears that a number of women of similar profiles have died in or around old London pubs. Is this a new, bizarre, serial killer at work, eliminating harmless middle aged women with a penchant for conspiracy theories? Arthur Bryant and John May with their long suffering PCU team go searching for a killer, even before the Home Office reluctantly agrees there is one. An interesting pub crawl around drinking venues in London, current and extinct, ensues, along with meeting some interesting characters and unusual clubs and societies. During the whole of the "murder" story the underlying dilemma of the PCU is also being played out. Can they survive Home Office cuts, a resignation letter and the diagnosis of a doctor? This book is like an onion. Peel away one layer and another is revealed, confusingly more complex than the last. The identification of the killer does not solve the mystery and a whole layer of subterfusion and subplot is revealed, as well as a surprise conspiracy being unmasked. This is delightfully complex tale with well written prose and an intricate subtext. 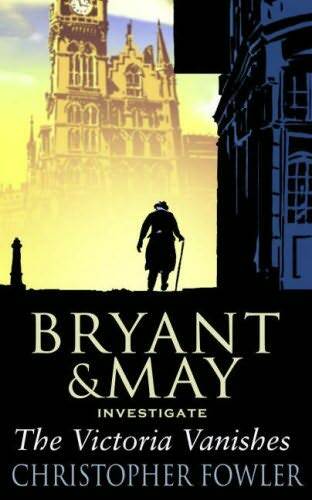 I enjoyed it immensely, having not come across the Bryant and May team before, and hope that this will not be the last. Read another review of THE VICTORIA VANISHES.